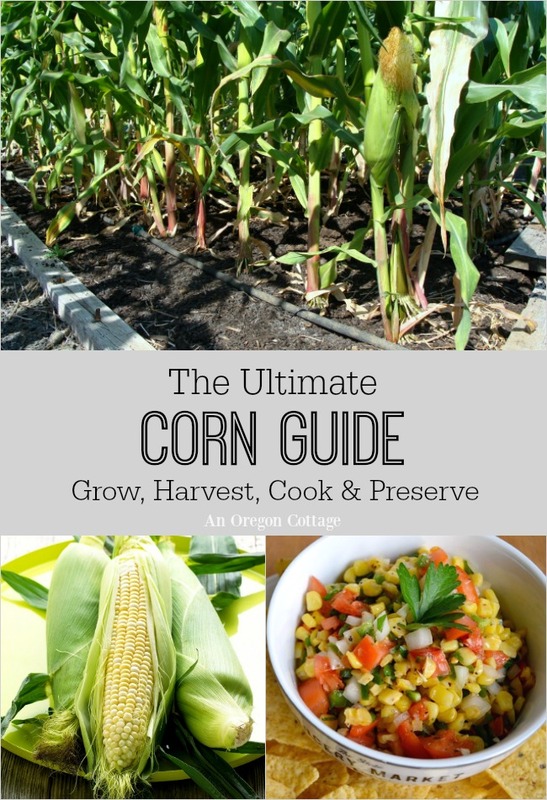 A one-stop corn guide to grow your own corn, gardening tips, plus lots of recipes and ideas for preserving and cooking with both fresh and preserved corn. This Ultimate Corn Guide is a part of this week’s Tuesdays In The Garden where we’re bringing you specific garden tips, techniques, and recipes. At the end of this guide, you’ll find links for how to grow tomatoes, parsnips, runner beans and an organic orchard guide. Enjoy! Delicious sweet corn, perfectly cooked and slathered with butter and salt – is there another vegetable that so perfectly sums up summertime? Picnics, BBQ’s, camp-outs – all of these are enhanced by good old corn-on-the-cob. Lucky for us, corn is easy to grow in most backyards and gardens! Though it does take room, even a couple short rows of corn will provide the freshest, sweetest corn you can eat. 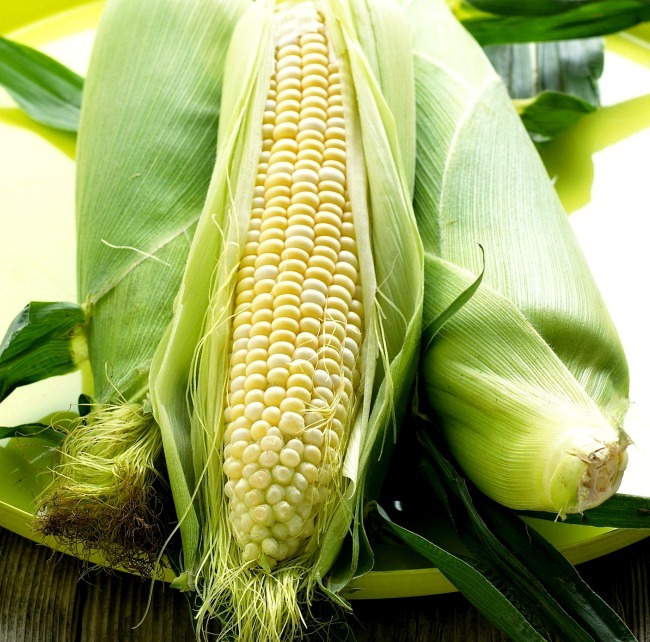 However, even if you can’t grow your own corn, it is easy and inexpensive to buy in season, so this guide (like our other fruit & vegetable guides) provides lots of ideas for preserving corn as well as many recipes you can make – only after you’ve had your fill of perfectly simple corn-on-the-cob, of course! For those who can grow your own, I’m listing my favorite varieties to plant, tips for growing without spending your life weeding, how to prevent all of your cobs ripening at once and storage tips. Why Grow (or Buy) Corn? I think corn has gotten a bad reputation in recent years, from the corn syrup controversy to anti-grain diets to low-carb eating. While it’s true that corn is considered a starchy vegetable (starch is a type of carbohydrate, along with sugar and fiber) along with peas and potatoes, it does have health benefits. It contains a good amount of potassium as well as fiber, protein, and vitamin C.
I found this Eating Well article on sweet corn myths to be very informative, giving information on GMO corn (mostly inedible field corn), if corn is “fattening,” and noting that “an ear of corn has about the same number of calories as an apple and less than one-fourth the sugar.” All good, since we love corn around here! Standard (su) – the least sweet, older varieties of sweet corn – the seeds are hardier and some feel have more of a ‘corny’ flavor, but they don’t hold well on the stalk or refrigerated, so are best eaten or preserved immediately. Sugary Extender (se) – a tender kernel that can retain it’s sweetness 2-4 days refrigerated. Supersweet (sh2) – these varieties are the sweetest, can be stored up to 10 days, but must be isolated from su and se types to produce true. Each of these categories contain a number of varieties you can grow, some of which you can see here as well as read more about the types of corn and the newer introductions. I like to keep it simple, and not worry about isolating, so I only grow the first two types, su and se. This allows me to plant all at once, but harvest at different times so we can enjoy fresh corn for more than a month. I consider the largest, latest corn, Incredible, to be my “main season” corn so I plant more and plan to freeze a lot of this for winter eating. If you only have room to grow one variety, stick with tried-and-true mid-season se types like Bodacious (75 days), Incredible (83 days), Miracle (84 days) for yellow corn and Lucious (73 days) or Peaches & Cream (84 days) for bi-color corn. There are a couple of important things to know about planting corn, but the biggest is probably not to plant it too early. It doesn’t like cold soil and your germination will be spotty if the soil is less than 60 degrees. Corn also performs best if it’s direct seeded, not started indoors (and most definitely not bought in pots at nurseries – I don’t know why they sell these!). 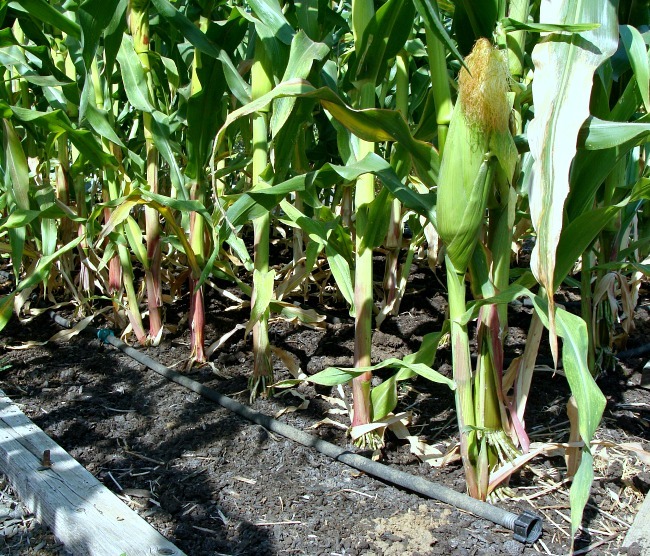 Grow corn in blocks of short rows rather than in long, single rows. 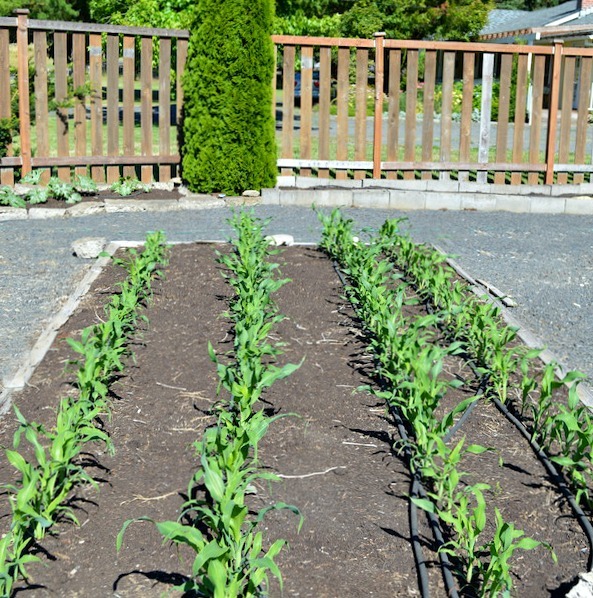 In a small garden, 15 plants set 1 foot apart can be grown in a 3 x 5-foot bed, so you don’t need a lot of room to grow corn. Set the seed 1 inch deep and 4 to 6 inches apart since the average germination rate for sweet corn is about 75 percent. Once they germinate in 7 to 10 days, thin to one plant every 12-15 inches. Tip: cover your newly seeded beds with row covers to prevent birds and cats from disturbing your bed. It really helps to get more even germination! My biggest tip that I wish I could tell everyone is that you DO NOT have to grow weeds with your corn. Ever. I plant with a no-till method using ground watering that I described here specifically for corn and other than pulling a random weed here and there, I do not weed our corn beds for the entire season. Really! 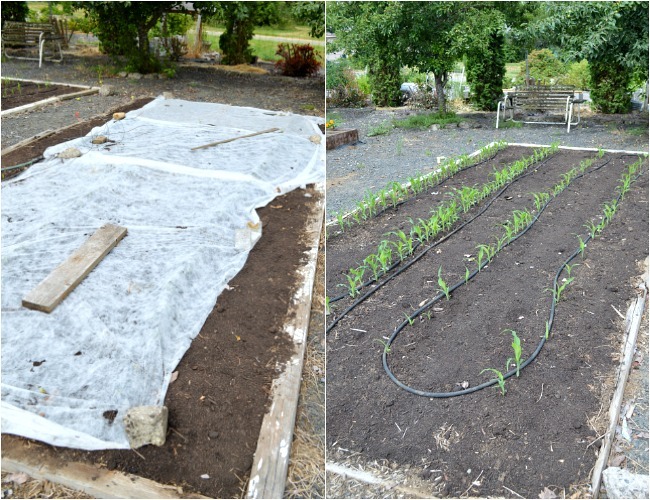 If you’ve ever had trouble finding your corn sprouts among the weeds, please read my tutorial for weed-free corn beds. Corn is ready to be picked as soon as the ears have filled out and the silks are dry. A way to tell if the ears are ready (other than by pulling back some of the husks) is by feeling the end of an ear – if it’s rounded rather than pointed, the ears are ready. Store it in the husks in large plastic shopping bags for 4-5 days, if needed. It’s best used in this time-frame, though I’ve been known to keep it longer! Click the arrow for recipe & preserving ideas + info on tomatoes, parsnips, runner beans & orchard care! I only grew popcorn this year, but I missed my supersweet! I wanted to experiment with something new, but not having the supersweet was tough. Definitely growing some next season! Our corn mysteriously had a very ad year. It just wouldn’t germinate and then ony half of those that did actually produced corn. The good news is, the corn taste great at table. Tender and sweet. But not enough to freeze this year. Thanks for the garden guide on growing corn Jamie. I’m heading over to look at your weed free corn beds. We are getting there but much yet to learn abut weed free gardening! We have grown Festivity heirloom for the past 8 years from seeds a friend gave us YEARS ago! We just harvested 48 ears and blanched them, cooled them, sliced the corn off the cobs and froze them. I have several gallon bags for winter corn chowder, or corn as a side vegetable 🙂 It’s really pretty, mulit colored corn with purple, red, pink and yellow kernels and very sweet! We thought the crazy wind here in NV might be too much for the slender stalks, so we planted 4 seeds and thinned it back to two stalks for support- needless to say, every single seed germinated, and we didn’t need the additional support for the stalks! We’ve never grown corn in our garden but I might give it a try. I love corn but I’m really picky about the corn I like, I think it comes from my mom’s family being from Iowa and being super picky about corn too. I used to help my mom freeze corn each year, she loved golden jubliee. It is a great tasting corn. We would pick up a few boxes of corn and everyone would help to shuck, boil, cut off the cob, and package for the freezer. It took most of the day but then my grandma, my aunt, my cousin, and our household would have corn for the year. I usually purchase a box or two from the local farm stand and freeze it for our family. But I think we might try growing corn in our garden next year. My friend one year successfully grew corn in a bunch of 5 gallon buckets, the only problem was the wind would try to knock them down. 🙂 That might be a good alternative for those who container garden. I never been able to figure out why they sell corn in pots at nurseries either, Jamie. Crazy!! Corn is a lot of fun to grow and there are so many amazing ornamental varieties as well. 🙂 Thanks for the info.